Buy fresh fruits and vegetables in our retail stores. Visit us! Buy fresh fruits and vegetables in our wholesale. 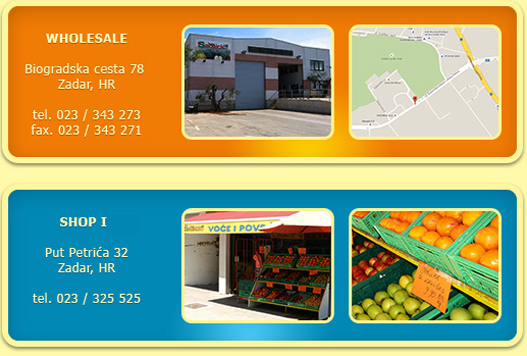 Wholesale is located on adress: Biogradska cesta 78, retail store is located on adress: Put Petrića 32, Zadar. T.O. Samirić has been active in this market for many years specializing in wholesale and retail sales of fruit and vegetables and supplying family-run and chain stores, catering and tourism facilities and public institutions with fresh produce.